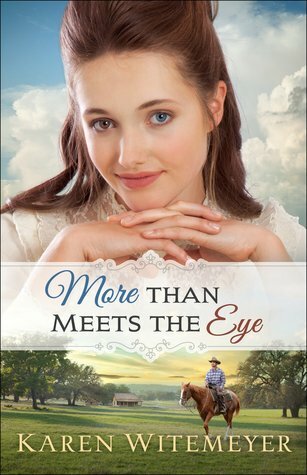 More Than Meets the Eye (2018) by Karen Witemeyer is the first book in her Patchwork Family series. This book recently published on June 5th by Bethany House Publishers, and can be purchased wherever books are sold. This novel comes in all forms including eBook, and is 352 pages in length. With a full-time job and quite the rambunctious six-year old at home, More Than Meets the Eye took me three days to read. I received a review copy of this novel in eBook form from Bethany House Publishers via NetGalley. In no way has this influenced my review. The opinions expressed in this review are my own. I give More Than Meets the Eye 5+++++ STARS. This story is a Christian Historical Romance. More Than Meets the Eye is an AMAZING story. I loved every minute of this book. From the heartbreaking prologue to the final paragraph of the epilogue, I was completely hooked. The storytelling in this book is stellar. There’s a debt that needs paying, an attempted murder, a mystery to be solved, creepy villains, and a friendship that blossoms into a very sweet romance. This book has everything a reader could want in a great book! Evangeline Hamilton is the main character, and she is excellent. I adore her personality, and wish I could be more like her. She is like sunshine, and it’s consistent. She is always able to see the best in people, and she never judges others. Because of her mismatched eyes, the people in her community treat her like she is a leper. At best, many ignore her as if she doesn’t exist. At worst, some say really awful and hurtful things about her just loud enough so she can hear. They accuse Evangeline of being a witch. They call her names. They are just plain awful. BUT, she never lets it get her down. Yes, this treatment pains her deeply, and she is so lonely being an outcast, but Evangeline never lets the meanness make her dark or blacken her soul. I found Evangeline’s character refreshing, and a great model for how a Christian should behave especially in the rougher times. It is at our weakest moments that we are actually our strongest IF we go to God. When we go to God, we have God’s power and presence surrounding us. There is no safer or stronger place to be than with God. And, that is exactly what Logan does. Once he realizes his grave error, Logan turns to God. He asks for forgiveness and help. And, wouldn’t you know it, God totally delivers! It’s a fantastic moment in the book, and it’s a great reminder for me. More Than Meets the Eye is a great read. I enjoyed every moment of this story, and I am really sad my time with Evangeline and Logan is over. I am so looking forward to the next book in this series. If you are looking for a highly engaging, fast-paced novel filled with excellent characters, a fantastic story line, and very timely lessons than this book is definitely the one for you! Sounds like another book to add to my TBR shelf. Thank you for the review. I’m waiting for this to show up in my mailbox! Love her writing! Me too! She’s one of my favorites!